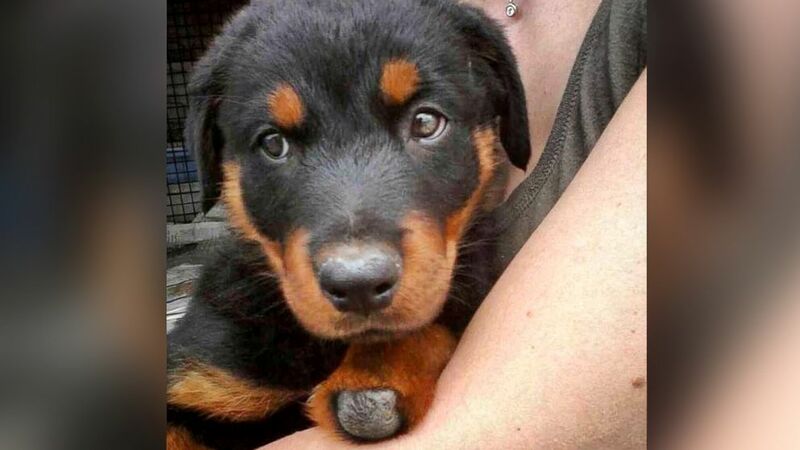 Brutus the rottweiler had all four paws removed as a puppy. Brutus the Rottweiler had a bit of trouble getting around because he became a quadruple amputee when he was just a puppy. "He was left outside by his breeder," said Brutus' rescuer Laura Aquilina. "I don't know if it was on purpose, but it was admitted that he lost his paws because of frostbite." After his limbs were removed, Brutus, now 2 years old, was rescued by a good Samaritan who Aquilina said met the dog when the breeder attempted to sell him in a parking lot. Because Brutus couldn't move around well, Aquilina, who lives in Loveland, Colorado, took Brutus to be fitted for prosthetics by OrthoPets Denver, a company that she had heard of through a fellow dog rescuer. "He's able to walk on softer surfaces like carpeting, but on something really hard like concrete he's much more comfortable in the prosthetics," she told ABC News, noting that Brutus was fortunate to be relatively close to the Denver company. "Before this, we never heard of OrthoPets. We are really grateful for them and their expertise," Aquilina said. (Better Paws for Brutus) Brutus lost his paws from frostbite when he was just a puppy. Each year, OrthoPets Denver provides prosthetics for 250 animals worldwide, according to the company. Brutus is the second case the veterinary clinic has seen of a quadruple amputee. "Brutus first received the prosthetics about 5 months ago," said OrthoPets co-founder Martin Kaufmann. "On the medical side, part of the challenge was when dogs lose their paws, their joints are increasingly unstable. He was more susceptible to injuries and additional pain associated with those injuries." "The large goal that we’re accomplishing is being able to get him outdoors walking on hard surfaces. Above anything else, he has comfort," Kaufmann said. With his prosthetics, Brutus is now able to walk, run and play his favorite game, tug-of-war. "When you take him out without his prosthetics, he knows that he can't walk on certain surfaces," Aquilina said. "When you put them on, he takes off. He even tries to chase squirrels in them. They give the ability to be a dog so I think he’s happy being able to do more things with them on." "Brutus is super sweet, ridiculously smart, and has a very forgiving nature," said Aquilina, who has been fostering Brutus since July 2014. "You would think a dog like him who's been through so much wouldn't trust people, but he's a very gentle soul." She said she and her husband have decided to keep him and the adoption will be finalized as of next week.